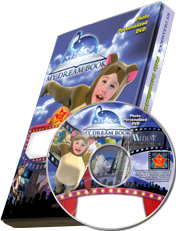 This Personalized DVD features your child as the star of these imaginative dreams. My Dream Book is a fantasy bed-time story geared for younger kids. Have a fun, rhyming time where your little dreamer gets to meet a friendly dragon, climb a beanstalk, march in a parade and much, much more! A soothing, relaxing movie that tells your star that going to sleep and playing in dream land is a lot of fun! This video encourages imaginative thinking, optimism and a fascination for new, creative possibilities. The child's picture is used 37 times. Length of DVD is approx. 10 minutes.